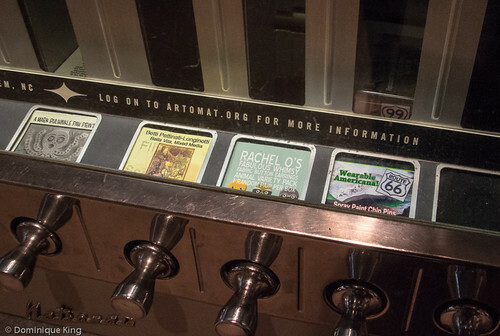 The first time I saw an Art-o-mat machine in Chicago's Cultural Center more than five years ago, I did a double take. I really didn't expect to see a cigarette machine in a public building, but I became pretty excited when I realized that the Art-o-mat I was seeing was a creative and fun way to recycle the aging cigarette machines to enjoy their cool graphics and help local artists at the same time. 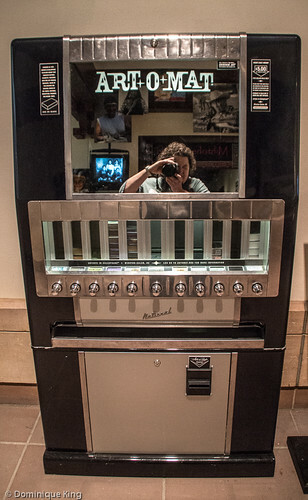 I loved telling the story of the Art-o-mat and how it started as the inspiration of an artist who first used an old cigarette machine to dispense his own artful miniatures during a gallery show in North Carolina. The next time I saw an Art-o-mat machine was just this past summer at the Eiteljorg Museum of American Indians and Western Art in Indianapolis, and I couldn't wait to check it out and purchase another miniature piece of art. The sign by the Art-o-mat machine on the second floor of the Eiteljorg Museum gave a quick history of the use of old cigarette machines as Art-o-mat machines and their purpose to encourage the consumption of art in an easy, ecologically responsible and affordable way. The Eiteljorg signage also noted how it somehow seemed appropriate encourage consumption of art in an increasingly consumer-based society in this way. So I dutifully put five dollars into the machine and selected my own private piece of art! I selected a box containing "Wearable Americana!" 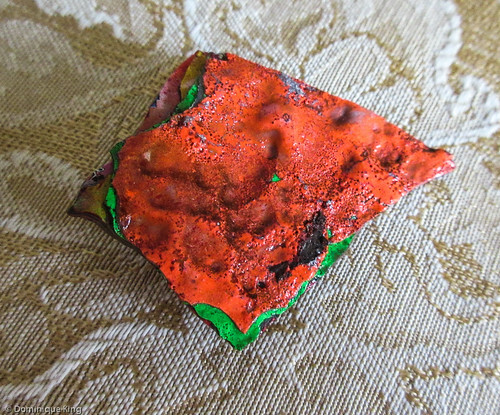 which was a pin created with a paint chip from the famous Cadillac Ranch in Amarillo Texas. 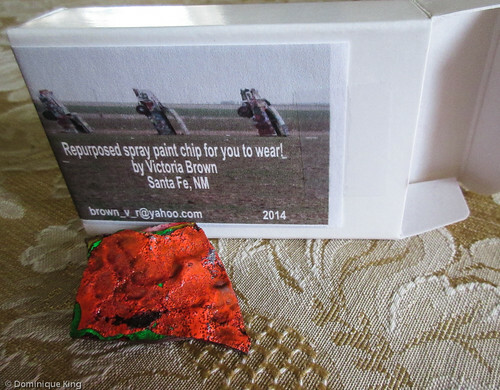 Santa Fe (New Mexico) artist Victoria Brown gathers paint chips that peel off of the Cadillac Ranch sculpture, a popular public art installation and Route 66 icon. Cadillac Ranch is a grouping of ten 1949 to 1963 vintage vehicles half-buried into the ground in a cow pasture along I-40. Visitors sometimes spray paint and tag the cars, and Brown creates her own public art from the spray-paint chips that fall to the ground, marketing her work in the repurposed Art-o-mat machine. This strikes me as the ultimate in repurposing discarded material and utilizing the repurposed cigarette machines to market her art. Brown's piece particularly appealed to me because of its past as public art and repurposed material. Plus I'm a bit of a vintage vehicle enthusiast who has always wanted to see Cadillac Ranch! Brown coats her paint-chip jewelry (pins, pendants, earrings) with a clear coat of acrylic and includes the story of her art piece's background in the box along with the jewelry. I reported that there were 82 active Art-o-mat machines in 2009, but today there seem to be a good number more of these refurbished cigarette machines dispensing art in locations mostly around the United States. (Sadly, I didn't find the Art-o-mat machine I first saw in Chicago on the list of active machines). 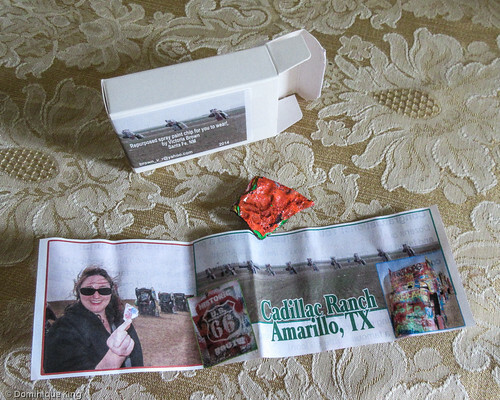 Want to learn more about Cadillac Ranch and other sites along the historic Route 66 highway? Check out Route 66 Adventure Handbook by Drew Knowles or check this classic music from Bruce Springsteen taking inspiration from the site. Check out this group photo pool at Flickr to see some great images of the Cadillac Ranch in Amarillo. Check out a guest post travel writer Nicole Wiltrout wrote about the Eiteljorg Museum for Midwest Guest several years ago, and be sure to check back here later this fall for our own story and images from our recent visit to the Eiteljorg Museum!